January 2009 was a really mixed bag of a month. Lots of good news - and a most enjoyable skiing holiday - but unfortunately there was plenty of bad news around as well. Today is the birthday of Lewis Carroll, and as it's done for the past five years, the web is celebrating the fact with Down the Rabbit Hole Day, where bloggers change the way in which they blog for 24 hours. My "change" started out as an involuntary one, but now I'm on a roll. Embrace the verbosity of the largest blog entry I've made for, oh, I don't know. Years, probably. I've been thinking quite a bit recently about Twitter. The main question I've been pondering is simply "why?" but as I'm sure some of you will be wondering "what is it? ", here's a little background information. Twitter was founded in 2006 by Jack Dorsey, Biz Stone, and Evan Williams. It's a website that is described variously as a microblogging site, a social networking service, or just a way of staying in touch with friends. You can use it from your computer or your mobile phone and like an SMS message, you're limited in the number of characters you can send in a single message, or "tweet" - the maximum is 140. This is part of the attraction: some of the people I follow on Twitter send messages that have the beauty of haiku or the depth of a Zen koan. It says a lot about the quirkiness of the company that even the image displayed when things aren't working quite as they should be - a picture known universally as the Fail Whale - has its own fan club. I've been using Twitter since November 2007 and my ID there is headfirstonly, if you want to follow me - which means that you'll see each of my messages on your Twitter page when I post them on mine. Stephen Fry is an advocate and an enthusiastic user of Twitter and yes, he's one of the people I follow. Twitter started getting mentioned in the media when Barack Obama used it as part of his presidential campaign, but after a Twitter user posted a photo of the airliner in the Hudson River last week using a picture-posting add-on to Twitter called Twitpic, the world really started paying attention. The distinguishing feature of Twitter is that it gets news out fast. Really fast. Twitter came to the fore during the Mumbai attacks when it was pretty much the only source of information for concerned friends and relatives wanting to know if people they knew were OK. At the time, a rumour swept across the city that the terrorists were monitoring Twitter to update their strategic information. Whether this was true or not isn't important. What is clear is that, like so many other things, rapid access to information has negative aspects as well as positive ones. For good or bad, the end result was the same: Twitter was at the forefront of what went on and Forbes magazine called it "Twitter's Moment". Last weekend, the website TechCrunch reported that Twitter was raising more investment capital against an estimated worth of $250 million. This may be one of the reasons for increased press coverage this week as the company sends out press releases to raise its visibility. Certainly the BBC have been running noticeably more Twitter stories as of late. As a user, it's good to hear that the company is expecting growth, but I'm still trying to figure out where Twitter gets its income from. It doesn't charge me for sending messages from the web, and I guess that my phone provider gets all the revenue from each text message I send, rather than Twitter. There site is refreshingly free of adverts, so they can't get any revenue from advertising, either. As a result of the recent publicity, things have become a little crazy. Large numbers of new users sign up every week and the company's growth is staggering. The whole concept of following is why I still have a certain amount of ambivalence about Twitter. I follow less than three dozen people, and from day to day I manage to keep up to date with all their messages. But a lot of the people I see on Twitter follow hundreds if not thousands of other users, and that's well above anyone's Dunbar number. That's based on observations which suggest that there is a cognitive and behavioural limit on the number of effective relationships that you can maintain in a social network. When the flow of information is from one to many, it's manageable for all concerned - but communication like this has nothing to do with social networking. So, describing Twitter as a social networking application isn't always appropriate, and it encourages expectations of the service that are unrealistic. The two-way aspect of Twitter appears to offer the potential for genuine social engagement to take place between you and anyone else on the planet - even Stephen Fry or the President of the United States - but in general it's an illusion of connectivity. It has to be, because the amount of information involved rapidly becomes too big for one person to assimilate. Think about it; if you are following 100,000 people on Twitter, and each of them posts just one tweet a day, that still means you'll receive an average of just over one tweet every second. Relationships don't scale indefinitely. Dunbar's number probably varies slightly from person to person and society to society, but it's usually cited as being around the 150 mark. Above that number, there's not enough two way contact between any given pair of individuals to maintain group cohesion. Right from the start of my time on Twitter, I decided that if I got followed by someone who already followed several thousand other users, I wouldn't return the favour. Instead, I use Twitter in two very different ways. Firstly, I use it to exchange status updates with people I actually know. Secondly, I use it as an information feed from people I don't know personally, but whose ideas and comments are interesting and thought provoking, or just plain entertaining. Occasionally I'll send a reply out to someone in the second category, but I never expect a response - as should be perfectly clear from the figures above, it would be irrational to expect otherwise. Here's an example of the interesting stuff that crops up on Twitter: thanks to Bruce Sterling, who tweeted about the Magazine Death Pool. It focuses on North American Magazines, which are dropping like flies as the recession hits home. I wonder how many UK publications are also falling by the wayside? I bet there are quite a few, even if the current news from the UK sector seems more positive than that from the US. As another example of how news can spread rapidly on Twitter, Neil Gaiman tweeted yesterday that his novel The Graveyard Book had just been awarded the John Newbery Medal. It's lovely news. I'd describe The Graveyard Book as Rudyard Kipling meets the afterlife; it was my favourite book of last year and it's super to see it get recognition in this way. The news on the Tin-Tin movie just gets better and better. Today I found out that Daniel Craig has been cast as the owner of some famous treasure: he will be playing the pirate Red Rackham. Jamie Bell is going to be playing the mild-mannered reporter, and Edgar Wright is helping to put the screenplay together. That's a pretty impressive - and strikingly British - ensemble of talent. I can't wait to see what the 3-D animated film is going to look like, but I hope they stay faithful to Hergé's original and distinctive look. There aren't many times where I find myself agreeing with the Mayor of London, but this is one of them. Boris Johnson is calling for the prosecution (although it looks more like persecution) of UFO enthusiast Gary McKinnon to be dropped. Read the article, and I think you'll end up agreeing with him too. McKinnon was no hacker - from the sounds of things, the security of the systems he accessed was so dire that he didn't need to be - and his motivation had nothing whatsoever to do with terrorism. Now that the Bush administration is over, perhaps the US government will realise the fact as well. You may already be in the habit of making gestures at the telly when there's something or someone on that you don't like. Soon your television will actually respond when you wave your arms at it. Damn. I should have gone skiing in one of these. And lo, there would have been much quoting of Life of Brian. Well done the Monty Python guys, by the way - by putting their content on YouTube for free they've increased sales of their DVDs by a whopping 23,000 per cent. It just goes to show how counterintuitive the Internet can be when it comes to business practice. Or maybe not - it's a new take on the old business process of offering a lagniappe - after all, offering something extra for free is a good way of encouraging sales. It's certainly more effective than suing your customers, as far as I'm concerned. Pixar's Andrew Stanton talks about Oscars and the metaphorical aspects of Wall-E and E-V-E's relationship. So that's why she has a big gun! Jonathan Ross returns to the air tomorrow night. The BBC are running stories about the matter, but it's not really news, is it? Whoever was tasked with creating what is in effect a thinly disguised advert for the show didn't appear to have put their heart into the task. Instead, they seem to have spent five minutes searching for "Jonathan Ross" on Twitter and cobbled something together out of the results, then bolted the transmission date on the end. Still, full marks to the BBC for trying to make it look like they'd written their own story; once you've had a browse through the efforts of The Metro, The Times, The Guardian and The Independent, compare them to the article from Sky News - who appear to be the only news agency who did some proper journalism and actually sent a reporter to the recording of the show. Is it just me, or do you find it rather worrying that most of the news that you watch or read these days has just been regurgitated from someone's web page or press release without any sort of critical assessment or scepticism being involved? I bet Public Relations seemed like such a good idea fifty years ago, but nowadays it's becoming synonymous with spin, lazy journalism and everything untrustworthy. It's faintly ironic, then, that the best take on the practice is a series made by the BBC called Absolute Power, which starred Stephen Fry and John Bird. 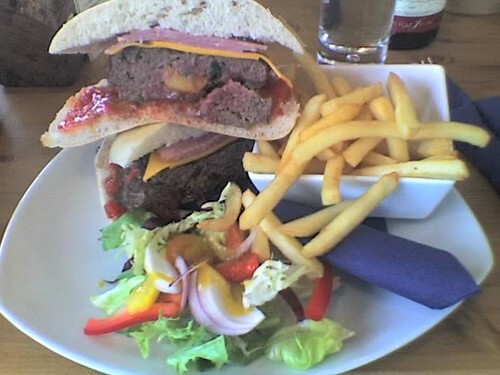 This cheese and bacon burger was really good, and it was just as enormous as it looks. If you're going skiing in the Portes du Soleil area and you want great food like this, you really need to visit La Grande Ourse restaurant in Mont-Chéry: go up the Telecabine Mont-Chéry from Les Gets and then catch the Teleski Super Chéry. The restaurant is on your right as you get off at the top. When we left the restaurant, a small boy on the next table was gamely tucking in to his burger, and it really was bigger than his head. Even Geneva Airport had modernised its eating areas - the new food court in Terminal 1 is a vast improvement, with a seafood bar and an Italian restaurant replacing the dodgy half-lit pub that used to be there. I'll admit that I had a soft spot for the doner kebabs they used to sell, but my main recollections of Geneva Airport involve being stuck there. I once had to wait there for what seemed like an eternity because the coach taking us to the resort had broken down and the tour operator hadn't got a replacement available. We had to wait while the travel agency - who used to claim quite accurately that "we don't do that" had to organise a replacement. Judging by the time it took, they must have built it from scratch. A couple of years ago I ended up marooned at Geneva for four and a half hours. Our flight was cancelled, and the tour operator proved spectacularly useless at doing anything about it. I won't embarrass them by mentioning which operator it was. This year couldn't have been more of a contrast. The trips to and from the airport were fast and painless; out transport was ready to go exactly when we needed it; we walked up to a check in desk with no queues in sight; the aircraft arrived on time and - best of all - I got a window seat on both flights, out and back. 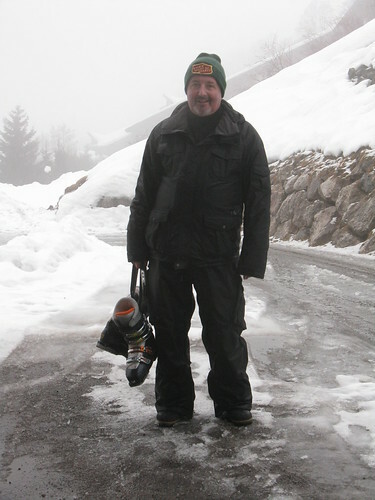 The photo was taken on Monday, after a day spent skiing across to Avoriaz and back in cold, unrelenting rain. I don't recommend skiing in rain as a leisure activity. At the point where this picture was taken I'd just walked back to the chalet, and I was absolutely soaked. My gloves were so wet I was able to wring about quarter of a pint of water out of them and I was steaming gently in the cold air. Despite the bad weather, the holiday was excellent. We were staying at the Chalet Les Pages in Les Gets as guests of Roger and Liz Leyland. Together with our chalet girl Ozzy they made us feel very welcome and looked after us very well. The food was excellent and the transfer out last Friday was the best I've ever experienced. We were heading up the mountain on the ski lift by midday! Expect more about the weekend's adventures in the next few days. The only trouble with getting old is that you hear about your heroes shuffling off this mortal coil with greater and greater regularity. I loved the TV show The Prisoner and hearing that Patrick McGoohan had died was such depressing news that I couldn't really face writing anything more than I did in last week'd blog entry. I've visited Portmeirion; I bought the soundtrack album to the series when soundtracks were still released on LPs rather than CDs; I've had my picture taken outside Number Six's house in London and I've had long and involved conversations with people about what it all meant. McGoohan was so much more than the character from one TV show - he was an actor, a writer, a poet, a producer and a director and he did all of those things on his own terms. Even if the obituaries focused on his career as Number Six, they all agreed he was very definitely one of a kind. Then in little more than a week I heard of the passing of Ricardo Montalban, Bob May and Tony Hart. Like McGoohan, each one of them had a profound impact on my life in childhood and early adulthood, and I'm sorry they're no longer with us. 2009 isn't shaping up so well, is it? All I can do is quote Warren Ellis: "Damn. Patrick McGoohan's dead." I always feel under the weather at this time of year; it might be the effects of the Christmas holiday wearing off, or the fact that I'm not getting enough natural light or enough sleep, but at the moment I feel rather down. To cheer myself up, I've been looking for stories that can make me think "hey, things could be worse." The best (or should that be worst?) example that I've found concerns a recent report by America's National Academy of Sciences. The report summarises the findings of a workshop on space weather that was held in Washington, D.C. in May last year. It's been drawing considerable comment after suggesting that the effects of a large solar flare could set back the global economy "by $1 trillion to $2 trillion in the first year alone" with recovery times of 4 to 10 years. Although solar flares have caused severe disturbances to the Earth's magnetic field in the past, most of the really big events happened before we built the communications and power distribution networks we have today. The New York Railroad Storm in 1921 is thought to have caused several fires as a result of huge electrical currents induced in telegraph cables; in March 1989 the power supply to six million people in northeastern Canada was knocked out when the grid's protection systems were overwhelmed by similar currents. Although measures were taken to improve the protection provided, the NAS workshop concluded that power supplies were still vulnerable. Storms on this scale would also knock out satellite communications and GPS, and the only remedy the NAS had for this was to have a pipeline of replacement satellites ready to launch. That's going to be expensive, to say the least. "two patches of intensely bright and white light broke out... I hastily ran to call some one to witness the exhibition with me, and on returning within 60 seconds, was mortified to find that it was already much changed and enfeebled. Very shortly afterwards the last trace was gone." "the Sun doubled its brightness for some minutes"
...which I suspect would have had significantly more serious effects than were noticed at the time (things probably wouldn't have burst into flames, but I'm sure it would have got everybody's attention). The actual variation in solar irradiance over the last couple of hundred years lies between 1358 and 1370 watts per square metre, and an analysis of records during solar flares shows that they affect that figure by no more than 30 parts per million. Quite a bit less than 500,000 parts per million that the Times was suggesting, anyway. The Times article just looks like someone not thinking through the implications of what he'd written. On the other hand, by using specific words like "brewing," ABC News seem to be deliberately trying to give the impression that the next big flare is already startng to happen, which I think is profoundly misleading. According to NASA, events on the scale of the Carrington flare only occur once every 500 years: The ABC story looks suspiciously like it was crafted in order to maximise fear among people who didn't have a science background. It's not like we're lacking in other stuff to worry about, after all. My ears, they are bleeding. Dave Lee Roth should never be combined with a Microsoft product, but especially not this one. Obviously I resolved to do something about this, so when I got home I dug out as many compilation albums as I could find to broaden my musical horizons a bit. I'm now less than 120 artists behind her. I imagine that as soon as she reads this blog and finds out what I've been up to things will change, but it's been great fun listening to some of the more obscure corners of my music collection as I caught her up! Both Rob and Ruth are back at university after the Christmas break. It's always a bit of a shock going back to work in January, but at least we've got the most stressful day over for another year. I'm not alone in feeling more tired after the holiday than I was before, but the good news is that it's possible to beat the post-Christmas blues by watching what you eat and drink, and getting a bit of exercise. Damn - my favourite strategy has always been going back to bed. William Gibson blogged an interesting web page which displays a panoramic view of Bath. It's an interesting way to show the spectacular views you can get of the city from the surrounding countryside, and it's well worth a look. As it loads a number of fairly large graphics files, you'll probably find your entertainment significantly enhanced on the second run through the presentation. Me too. How about a packet of crispy duck and hoisin sauce flavour crisps? Yummy. I'm not too sure about the chilli and chocolate or the cajun squirrel flavours, though. A lot of the time, when folk say "I LOLed" they don't really mean it. So when something really does make me laugh out loud, I want to share it. Randall Munroe, take a bow; the latest XKCD is a work of comedy genius. One of my favourite little gadgets here at home is a little weather station with an external temperature sensor, complete with Max/Min readings. Last night it picked up a minimum temperature of -7°C (19.4°F). The West Country is definitely in the grip of a cold snap and I don't think the temperature got above freezing all day. When I got home this evening, the car was telling me it was -3, and it was only just beginning to get dark so it's going to be exceptionally cold tonight. I hope you're managing to keep warm, wherever you are. Update: the lowest temperature I recorded overnight on Monday was -9.8°C (14.4°F), which is the lowest I've seen in the 14 years I've lived here. AICN are reporting some interesting casting news for the Tintin movie being made by Steven Spielberg: Nick Frost and Simon Pegg will be playing the mustachioed detectives Thomson and Thompson. I'm not quite sure what to make of this; I hope that the weird casting will mean that we can expect something entertainingly bizarre as a finished product, something as quirky and different as Herge's original creation could be. Given that Andy Serkis has been cast as Captain Haddock, anything's possible. As recommended by Jason Kottke: The greatest special effects shots in the history of cinema. Pretty much every favourite of mine makes it into the list - and a significant number of my favourites were made by the master himself, Ray Harryhausen, without any need for computers whatsoever. Now that's class. Keep reading after you find out what #1 is, too - the notes and discussion at the bottom of the page about some "classics" that didn't make the cut are almost as interesting as the stories about each clip that was included. I'm back home after a week and a bit spent travelling around the country catching up with friends and relatives. It was lovely to see everyone, but it's also nice to be home. I wish it was a bit warmer, though; as I write this, it's trying to snow outside. The news seems to be pretty dismal at the moment - and these days it's becoming evident that we can't always trust what we see on TV. As far as I'm concerned, whichever side is giving the correct version of events is immaterial; I'm with Isaac Asimov. I thought that this year's Doctor Who Christmas special was a vast improvement on last year's. The title and the impending casting decision got the show a lot of coverage over the holiday break too - even if it turned out to be a red herring and David Morrissey isn't going to be taking over duties as the next Time Lord. Well, duh.